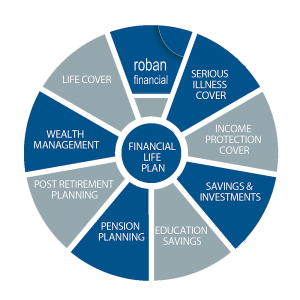 Roban Financial specialise in financial life planning. We always view our services in terms of our clients’ needs, and we will continuously work with you to help you build the kind of future you desire. We do this in the spirit of family values, life enjoyment and peace of mind for the future. Our goal is for you to achieve your financial objectives, our role is to guide you there. Our clients value our services and each and every client requires a different service, dependant on the stage of their lives they find themselves at. We gain a complete understanding of your current financial position by completing a full Financial Advice Planner. We want to understand all aspects of your financial life – your current assets & liabilities, your income and expenses and a range of other relevant information. We also seek to understand exactly what it is that you want to achieve in your financial future. Hence our service is your Financial Life Plan. We complete a full risk profile assessment and discuss how this matches your expected return on funds. We also explain the importance of risk profiling and how your risk profile is established. Once we understand your current position, where you are trying to get to and how much risk you wish to take, we then suggest to you ways in which you can look to achieve your financial objectives. Once you decide to proceed and if a financial product is required, we research the market to identify the best product to meet your needs and then negotiate on your behalf with the chosen provider to ensure that you receive the best terms possible. We then explain the full process to get the financial product in place and help you complete the paperwork and all other parts of the process. We then agree a review schedule with you. This is critically important to ensure that the solutions put in place remain appropriate, as your own circumstances will probably change over time, and external factors such as investment markets, the economy etc. may impact too. We start by meeting you and listening very carefully. We also set out how we work with clients in general and how we propose we will work with you.